A unique treasury of flavour combinations, offering endless diversion and inspiration for the creative cook. Ever wondered why one flavour works with another? Or lacked inspiration for what to do with a bundle of beetroot? 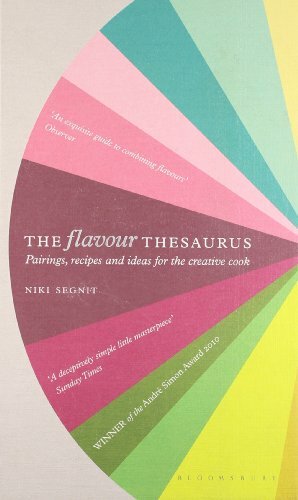 The Flavour Thesaurus is the first book to examine what goes with what, pair by pair. The book follows the form of Roget’s Thesaurus. The back section lists, alphabetically, 99 popular ingredients, and suggests classic and less well known flavour matches for each. The front section contains an entry for every flavour match listed in the back section and is organised into 16 flavour themes such a Bramble & Hedge, Green & Grassy, and Earthy. There are 980 entries in all and 200 recipes or suggestions are embedded in the text. It covers classic pairings such as pork & apple, lamb & apricot, and cucumber & dill; contemporary favourites like chocolate & chilli, lobster & vanilla, and goat’s cheese & beetroot; and interesting but unlikely-sounding couples including black pudding & chocolate, lemon & beef, blueberry & mushroom, and watermelon & oyster.